So I’m doing something a little different for today’s post. It seems like a good day for a fine art reference, hm? Let’s talk about Salvador Dali’s painting, The Persistence of Memory. For some reason it’s been on my mind as of late. Maybe because I feel like I’m at a crossroad in time as far as my life goes. I’m moving from one stage in life to another. and time doesn’t stop for that. 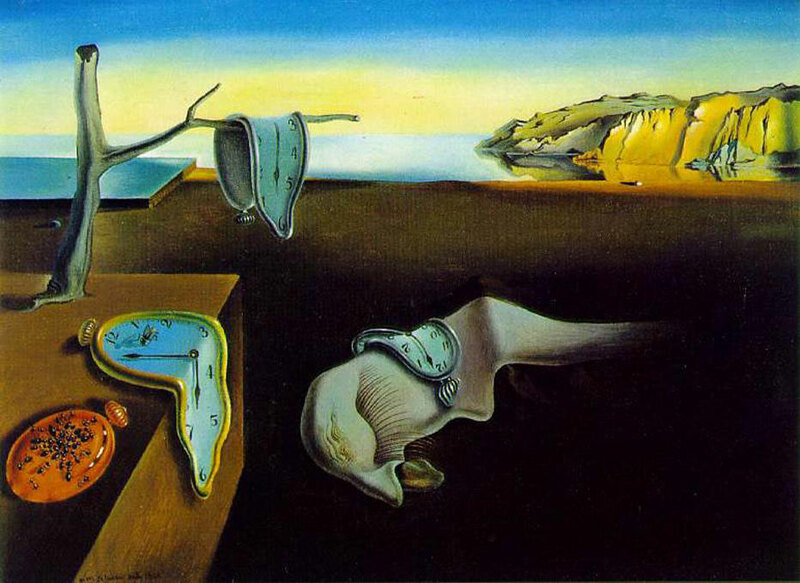 Pictured above is a recreation of The Persistence of Time I put together tonight. I took some liberties, such as removing the ants and flies. (That omission in itself is interesting, seeing as how many would believe that the presence of those little creatures symbolize death. I also moved the grey piece of wood that was originally on the left side of the painting. but the one I’ve always fancied is that it’s a mirror. The flesh colored blob on the original painting is supposed to be a self-portrait of Dali. It is definitely an introspective piece, even if it is meant to be an unconscious one at that. 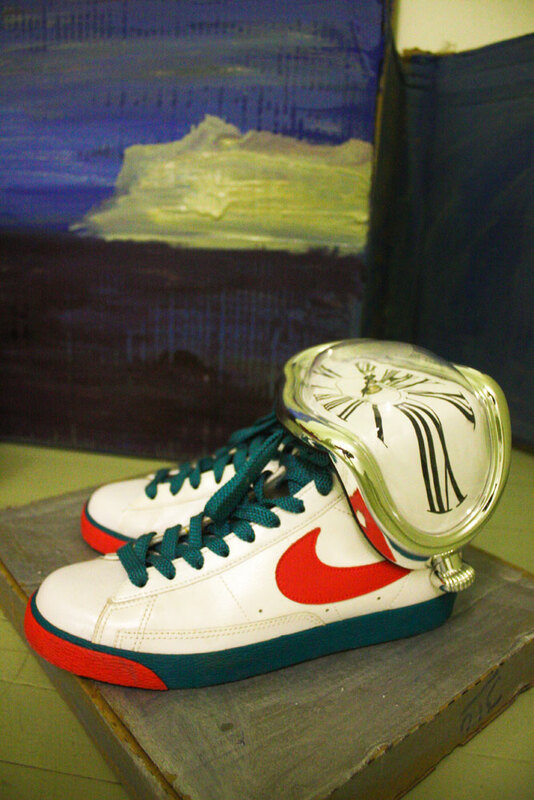 The reason I put my Nikes in place of Dali’s face is because I wanted to turn the idea of his work around and see my life through it for a bit. When I am depicting myself in my own work, there are little signifiers or symbols I have to hint at it being about me. Sometimes I draw unimaginably long hair, show that my middle fingers are crazy crooked, or put a pair of Nikes in it. 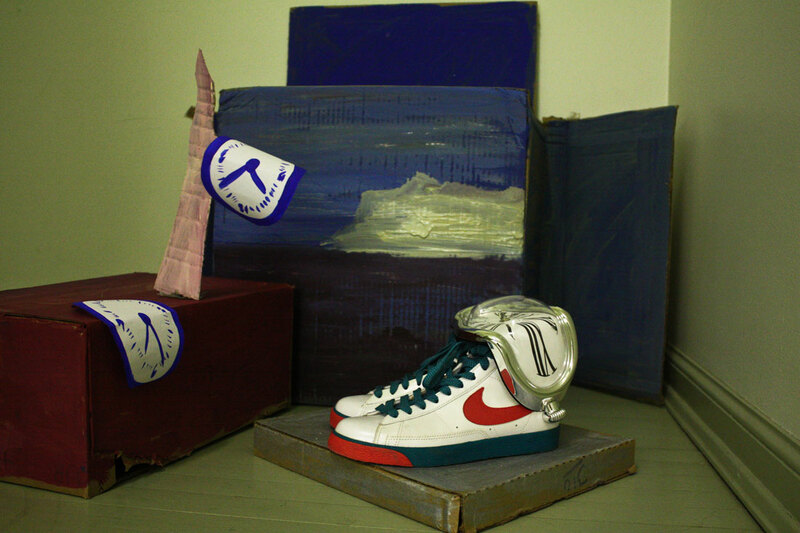 So in a way, putting my Nikes in there I am making it a self-portrait of me. And moving the mirror to under the Nikes plays with the idea of reflecting on one’s self. I did a little reading The Persistence of Time in some of my old books tonight. It’s a beautiful thought, isn’t it? I feel a connection with that thought. A lot of times I feel at a loss to express half of things that go on in my brain. I try to let it out through photos, or drawings, or whatever other means I feel like at the moment. They are like hand-painted photos of dreams. Above is Dali’s painting, The Persistence of Memory. (On a side note- it’s interesting that I decided to talk about the piece he’s most well-known for. mostly because I think they might have something to say about it that we wouldn’t expect. Think about all the times you’ve heard musicians talking about the song that has made them famous. A lot of times they end up hating or getting sick of their hit. And it really makes me wonder what the artists think of their pieces that generate so much discussion than their other work. Seriously though, I really do wonder what Leonardo would think about the big fuss over The Mona Lisa. Pingback: The Persistence of Memory | My BlogThe Philosopher's blog.